HIBERNIAN have made a categorical denial that striker Leigh Griffiths assaulted both his manager and assistant manager following a training ground spat. A report said that the player, who is on loan from English Premier League side Wolves, had no future at the capital club, alleging that he had headbutted Pat Fenlon before landing a punch on Billy Brown. The claims were refuted by the Leith side yesterday, with Griffiths expected at training along with the rest of the first-team squad this morning. Club insiders revealed that there had been an ill-tempered dust-up during training between players and they admitted that Griffiths had been instructed to leave the training pitch to cool down. The player was seen walking away from the training ground before the squad’s session finished. But the suggestion that there had been an assault on the management team has been rejected. “Hibernian will not tolerate, nor be distracted by, unverified and irresponsible ‘reporting’ in the media,” said a club statement yesterday. It is not the first time Griffiths has attracted negative publicity, since his arrival at the club he supported as a boy. Out of the reckoning at Wolves, who he joined in January 2011, he was happy to extend his loan spell at the capital club in January. But three ill-advised hand gestures during matches mean he has been rapped by the game’s governing bodies and served three suspensions. 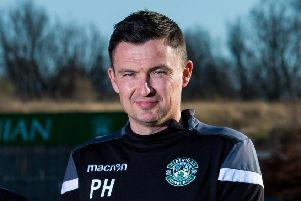 After the second gesture, he was warned by manager Fenlon that his on-field conduct would have to improve if he wanted to remain at the club and despite the third transgression he has been an integral part of Hibs’ quest to avoid relegation. Fenlon has made it clear that he will not countenance indiscipline from his squad as he attempts to focus their attentions on survival, and has publicly criticised the actions of Griffiths following those on-field gestures but he spoke out yesterday in defence of the 21-year-old. It was a stance backed by players and the rest of the management team. Speaking last night, Brown claimed the training ground incident was nothing out of the ordinary and occurred at clubs the length and breadth of the country. He was unequivocal in his denial that either Fenlon or himself had been targeted by Griffiths. Neither Griffiths nor his agent were available for comment yesterday.